It’s now that time of year when major corporations release their annual reports covering the previous 12 months. Several poker companies have recently revealed their numbers for 2018, and they paint a mixed picture of the online poker landscape. PartyPoker was a big winner while PokerStars stayed more or less flat. 888poker, on the other hand, saw a substantial decline in its fortunes. 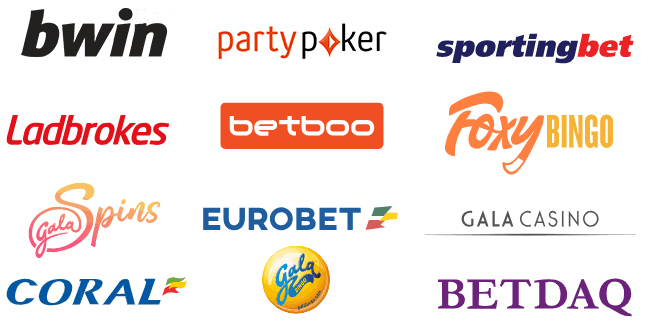 PartyPoker, part of the GVC Holdings family of sites, grew substantially in 2018 vs. 2017. Indeed, statements from management and figures contained in GVC’s 2018 annual report indicate that the PartyPoker brand saw online poker revenue increase 42% year-over-year. GVC doesn’t break the numbers down in sufficient granularity to precisely identify how much revenue came specifically from poker, but leading industry experts peg it at around €137 million ($154 million). PartyPoker started 2018 behind rival 888poker in the traffic rankings, but by about the middle of the year, Party surpassed its eightophile competitor. At present, this situation remains unchanged with Party solidly in the top five sites for internet poker liquidity and 888 lagging several spots behind. As it stands right now, Party trails only PokerStars in terms of player counts. The revamping of Party’s rewards program in mid-2017 to deliver higher effective rakeback percentages appears to have borne fruit. So too have other promotional offerings, like a $20 million tournament that the site ran in December 2018. PartyPoker is only one of the divisions of the GVC conglomerate. Other sister brands that performed well in the recently concluded year include Sportingbet, bwin, Eurobet, and Ladbrokes. The GVC group as a whole booked proforma NGR of £3.57 billion ($4.7 billion) for 2018: a 9% increase over 2017’s £3.29 billion ($4.33 billion). Though PokerStars skyrocketed from niche status to the dominant player in the space in the decade following its 2001 inception, the story since then has been one of slowing growth and even stagnation. Undoubtedly, this is partially a consequence of the fact that there’s not much remaining headroom available for the undisputed largest online poker site in the world. However, decisions made by parent company The Stars Group have played a role too. 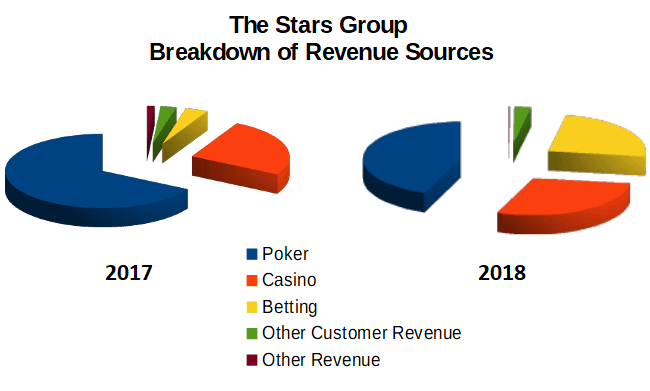 For the 12 months concluding at the end of 2018, The Stars Group made $892.6 million in poker revenue as opposed to the $877.3 million that it recorded in 2017. This is a relatively negligible gain of 1.7%. However, this is about in line with what we’d expect given that the firm has been attempting to diversify its revenue streams away from low-margin poker and toward potentially more lucrative product verticals, like casino games and sports betting. The acquisition of Sky Betting and Gaming, announced in July 2018, was the most notable manifestation of this philosophy during the past year. Though poker is largely a distinct channel from sports and casino, some cannibalization of cardroom revenue was only to be expected as the organization diverts more of its resources toward other revenue streams. The numbers bear this out. In contradistinction to the paltry 1.7% gains from poker, the contribution from the casino increased 75% from $334.8 million to $585.8 million. Betting revenue meanwhile skyrocketed 898% from just $49.2 million in 2017 to $491.1 million a year later. Adding all the figures together, total revenue went from $1.312 billion to $2.029 billion year-over-year: an increase of 55%. While poker fans might be miffed at the shift in focus away from their favorite pastime, shareholders are likely very pleased by this result. In early 2019, we commenced the phased roll out of Poker 8, a new and improved cross-territory Poker platform, which we are confident will provide new momentum to 888poker following a challenging year where revenue decreased by 37%. In addition, we are also excited about the forthcoming launch of 888’s shared poker player liquidity network across selected European markets. So there are plans in the works to turn the ship around before it founders entirely. Meanwhile, strong results from casino and sports betting have largely offset the revenue loss in the poker (and also bingo) sections of the enterprise. 888 Holdings as a whole reported $529.9 million in revenue compared to $541.8 million in the prior year. This is just a 2% decrease. Although the end of internet poker has been predicted regularly for quite a while now, the biggest firms in the industry don’t seem to be too worried. 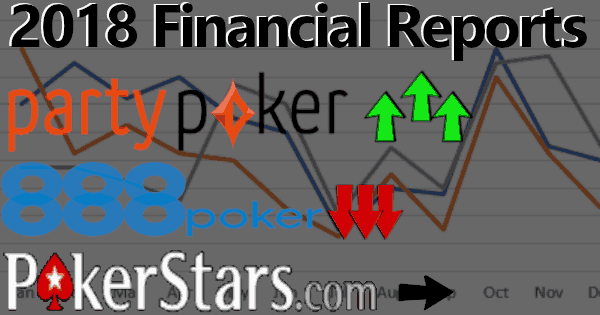 PartyPoker posted solid gains, and PokerStars’ results remained healthy if uninspired. Only 888 really disappointed in 2018, and these lackluster numbers were pretty much compensated for by enhancements in other online wagering products. If you’re eager to head online and check out these three sites, we’re sorry to inform you that you cannot if you’re a USA resident because all of them abandoned the American market some time ago (with a few exceptions: read our PartyPoker NJ review and our PokerStars NJ review for additional info). Nevertheless, you have places to play online poker while located in the U.S. There are plenty of operators housed in international jurisdictions that pay scant heed to the USA’s strict anti-gambling laws, like the Wire Act and the UIGEA. These rooms happily welcome individuals from most countries in the world, including the United States. Learn more about them with our exhaustive USA offshore poker overview.